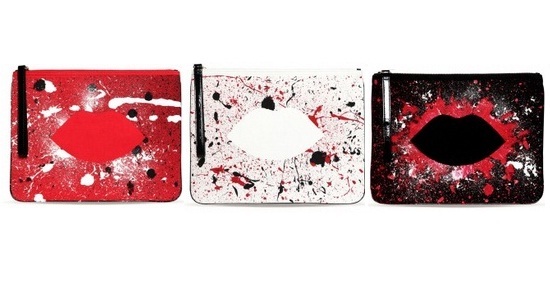 If you missed the spectacular launch of the Lulu Guinness Paint Project, fear not as the gorgeous clutches are still available to buy online and in Lulu Guinness stores. The British accessories designer has teamed up with contemporary artist Joseph Steele and beautiful Crime to create a line of innovative decorated clutches. Steele is known for exploding paint across the canvas to create stunning pieces of art, and this time he’s used the bag as his medium. The result? Although the bags follow a basic design pattern, no two clutches are entirely identical, and this means that in essence, you’ll have your very own bespoke clutch. The Hug and Hold clutches are currently retailing at £295 and are available in black, red or stone hues. The pieces make up a limited-edition collection but what else would you expect when you’re being treated to a unique piece of artwork by a leading artist? The clutches are the perfect buy for the woman who likes to be a bit of a trendsetter, or even just somebody who needs something fashionable to carry their iPad around in. And we all know too well just how difficult it is to find a really stylish iPad bag!